I need some ideas for using GarageBand or Soundtrap! Almost every day I see a music teacher post on Facebook asking for ideas for using GarageBand or Soundtrap with their students. 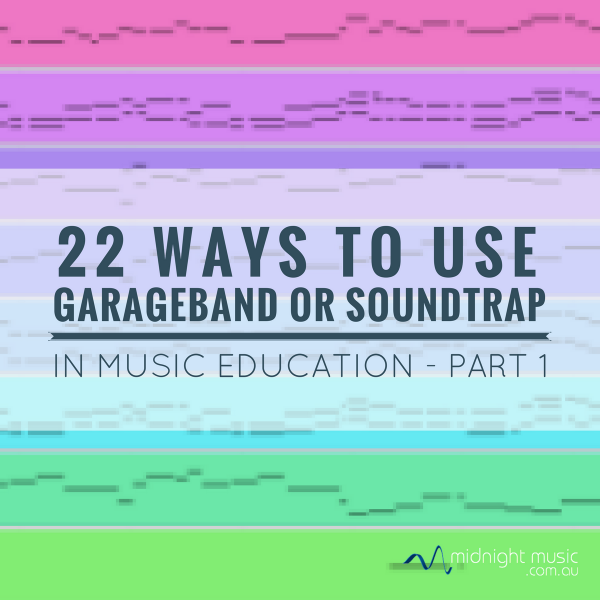 Most teachers are keen to use GarageBand or Soundtrap in a meaningful way and want lesson ideas that will teach musical concepts. My Golden Rule for all music tech projects: do the entire project yourself from start to finish. In this episode I am referring to desktop version of GarageBand and Soundtrap. Many things will also work on the iPad version of GarageBand and also on Mixcraft and Soundation. Beginner projects should be simple. Stick to 1-3 tracks and keep it short (4-16 bars long). Ready for part 2? Click here to listen. Want to thank you so much for the Christmas video suggestions for this time of year. Students have absolutely loved them, especially the Jingle Bells 🔔 Animals, all year levels it had appeal for and savvy little ones clearly understand the process involved in making such videos! So much quicker than my older generation!!!! And the older students sang along, varied styles to 17 variatiatons of Jingle bells, Pianist / piano then the Nutcracker Suite, Ballet performed by Orchestra + Michael Jackson foot work + Ballet moves !!!! Such a busy time of year, perfect !!!!!!! Thanks Helen! I’m happy they were useful. I love those videos 🙂 Sounds like the students had a great time! Help .. I’m in a panic. ., Trying to find some planning for 9-10-year-olds using garage band. I want to introduce Garageband and show them how to make some background sound for movies on the IPAD – I have nt a clue where to start. Any suggestions, please. Hi Paul – I’m afraid I might be too late, but there are some downloadable notes on this page from a workshop I ran last year. The first thing in the Session Notes section is DIY Soundtracks which uses GarageBand on iPad. Lots of teachers have also had fun with this Spooky Music GarageBand iPad project.